On December 3, 2016, we hosted our Annual General Meeting at the Aloft hotel in Tucson, AZ. Our theme, “Harnessing the Power of the Grassroots to Reduce Light Pollution and its Environmental Impacts Worldwide,” describes the role IDA’s many enthusiastic supporters play to protect dark skies. 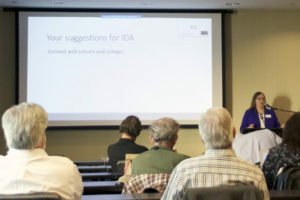 The day began with a presentation from Megan Albaugh Bonham of Northwestern University who gave a detailed review of our first-ever member survey. Bonham shared with us member’s visions for IDA and suggestions about how we can become more influential leaders. The survey provided us invaluable information that will lead us into a much stronger and knowledgeable future. Our special luncheon presentation was given by Susan and Mark Adams, the Recreation Managers of the New Katahdin Woods and Waters National Monument in Maine. The land was recently named as a National Monument, a great success for the pair. The land was once owned by the the co-founder of Burt’s Bees, Roxanne Quimby. 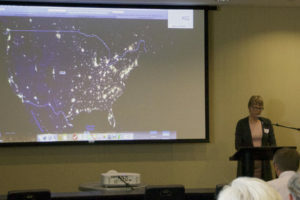 One highlight of the presentation was a photo of the U.S. at night (see above). As the photo shows, Maine is one of the only areas in the eastern part of the country that remains truly dark at night. The two are admirable advocates for protecting the natural environment. IDA chapter leader Bruce McMath (IDA Arkansas) inspired us with his work with volunteers. His ability to inspire immediate action and create momentum in the fight to protect our dark skies is momentum we cannot afford to lose. McMath described what he sees as a lack of enthusiasm behind the dark sky movement. He compared gun advocates, on either side of the argument, as having an enviable emotion and energy. He suggested that if we had similar drive behind our mission, we would be much farther along in our success. Tom O’Key (IDA Southern California Deserts) presented “Inspiring Citizen Activists into Action – Tips on mobilizing communities in support of dark sky policies.” O’Key spoke about the enormous tool one has when they show someone Saturn’s rings for the first time. That moment both opens one’s eyes to the wonders of the universe and opens the door for sharing with them the importance of protecting our dark skies. 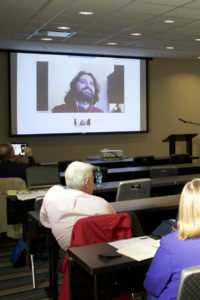 Andreas Papalambrou (IDA Greece) presented on the “Dark Sky Efforts in Greece.” Papalambrou joined us by telepresence to update AGM attendees on efforts in his country. 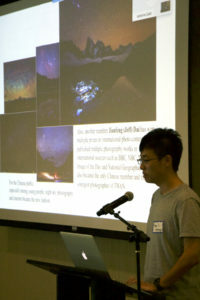 Ruoyo Li (IDA Beijing) shared with us about ongoing efforts to protect dark skies in China. Li gave us a showing of a video the Beijing chapter has created, “Heavenly Ali, Best Sky”, a short film on dark skies protection efforts in Tibet. 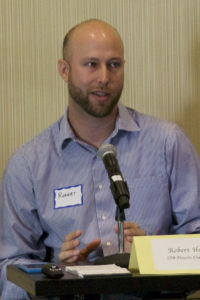 Robert Hobbins (IDA Phoenix, Arizona) presented his research on influencing local residents’ perceptions of dark skies. 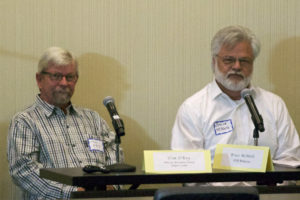 Hobbins has held workshops with a variety of dark sky supporters. He describes the many reasons each individual supporter has for supporting IDA’s mission. Examples as to why individuals support IDA’s mission are to allow for astronomers to continue studying the universe, improving our health or protecting wildlife. Even though the range of interests in dark sky support is wide, Hobbins has found ways to bridge this gap. Through these conversations, Hobbins has provided an opportunity for groups to unify in their mission. Hobbins also spoke about the recent success in urging the ity of Phoenix, Arizona to opt for low color-temperature white LED lighting in its pending conversion project. 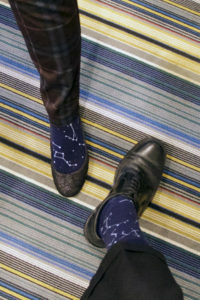 Showing support for dark skies with matching socks. Our Annual General Meeting was a fantastic opportunity for networking as well as a peek into the lives of supporters from all around the world. 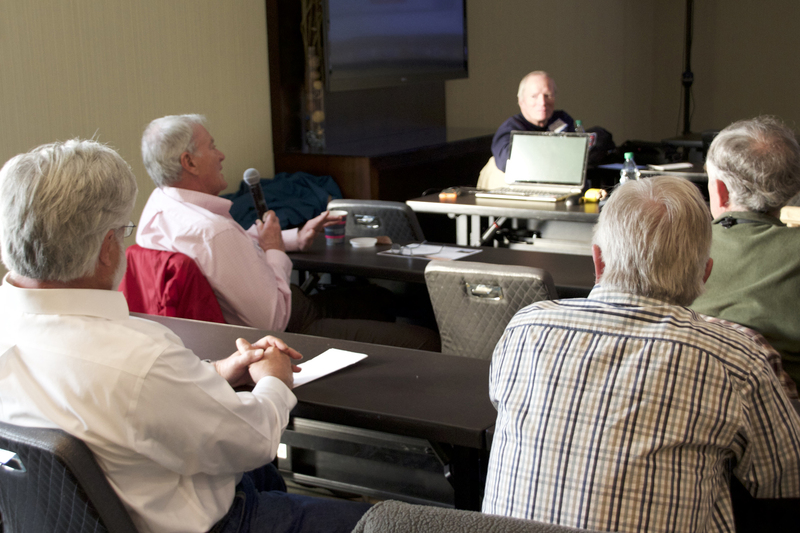 We are all a part of a wonderful community of dark sky advocates. The day was an invigorating experience to reunite our passion for saving the dark skies.